If you click the images or links in an ad or sponsor advertisement, we will provide your subscription contact information (not your email) only to this advertiser or sponsor. Toyota is crediting loans and grants from the Canadian and Ontario governments for its decision to build the electric version of the RAV4 sports utility vehicle in Woodstock, Ont. Learn more. Honda is recalling 135,142 vehicles in Canada to update the software that controls the automatic transmission. Learn more. Ontario's Liberal government has renegotiated a $7-billion green energy deal with Korean giant Samsung to save $327 million, but the opposition parties condemned it as a secret, untendered contract given to a foreign multinational. Learn more. General Motors announced that it will invest $117 million to prepare its assembly plant in Oshawa, Ont., to build the new Cadillac XTS next year. How many jobs will this create? Read on. Ontario is helping Centennial Global Technology expand its solar manufacturing business and create 50 new jobs in Kingston. Learn more about the investment. Navistar International is closing its truck manufacturing plant in Chatham, Ont. — a plant that's been idle since 2009. Learn more. Take the Canadian Manufacturing Survey and enter to win! Manufacturing AUTOMATION, in conjunction with the Excellence in Manufacturing Consortium, is benchmarking manufacturers and giving you the opportunity to compare your facility to others across Canada. Participate in our annual Canadian Manufacturing Study — with only 20 questions to answer — and you can enter to win one of FIVE $100 Canadian Tire gift cards. Take the survey. Manufacturing AUTOMATION contributor Jonathan Gross recently interviewed Syspro Canada's president, John Fahey, participated in a software demonstration, conducted a client reference check, and undertook secondary research. After all of that, what does he have to say about the company? Read on to find out. 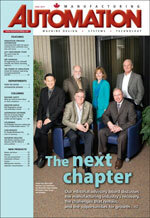 Cover story: Happy Anniversary – MA celebrates 25 years! A look at Manufacturing AUTOMATION over the last 25 years. Plus, industry analyst and futurist, Jim Pinto, will highlight how industrial automation has changed over the last 25 years, and what's to come. Who is Canada's safest manufacturer? We reveal the results of Canada's Safest Employer contest, brought to you by our sister publication, Canadian Occupational Safety magazine, with profiles of the winners. Plus: Lean manufacturing, and a selection of the latest enclosures and workstations, power supplies, programmable control products, RFID offerings, wire and cable products, as well as the latest in wireless technology and security. Sept. 18-21: 26th Annual Material Handling and Logistics Conference - West Allis, Wis.
Sept. 26-28: Pack Expo Las Vegas 2011 - Las Vegas, Nev.